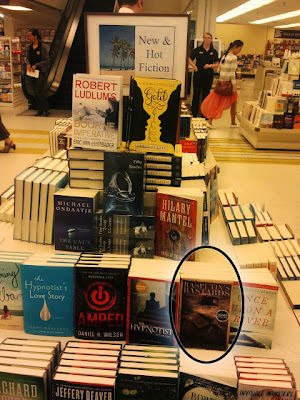 This is a photo from the front of The World's Biggest Bookstore, just as you come in, in the New and Hot Fiction display. Rasputin's Bastards is right there, next to The Hypnotist. I think it's fair to say we're off. "A journey from the depths of the sea, the heart of Mother Russia, to the darkest corners of the soul, this book appeals to the reader’s intellectual curiosity, and engages the heart with surprising moments of emotionality." "Bram Stoker Award winner Nickle's (Eutopia) latest novel tells a complex story of supernatural horror and psychological suspense crafted with the somber foreboding of a Russian novel and the genre-breaking freedom of magical realism. VERDICT This novel is supernatural eeriness at its best, with intriguing characters, no clear heroes, and a dark passion at its heart. Horror aficionados and fans of Stephen King's larger novels should appreciate this macabre look at the aftermath of the Cold War. " It's all a very good start. On Thursday June 21, those in Toronto should consider themselves invited to the official book launch. It's taking place at the Rasputin Vodka Lounge (seemed appropriate) at 780 Queen Street East. It all starts at 7 p.m. There will be books, and of course vodka, and some caviar on the menu. Spread the word far and wide. Mine appeared on the doorstep this Saturday. Reading shall commence shortly.